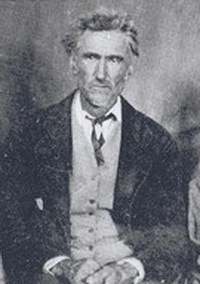 [S3653] Earl Peckham, family tree titled "Earle King Peckham Family Tree", published by Ancestry.com, wc.rootsweb.ancestry.com, from database named ekpeckhamfamily, updated Nov 2011, viewed Apr 2015.
from "Llano County, Texas-Family Album-A History"
John Stone was born in either South Carolina or Virginia between 1780 and 1790. 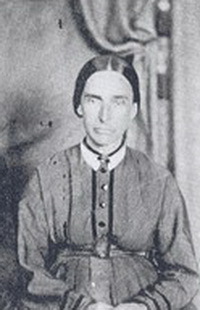 His wife Elizabeth was born around 1790 in North Carolina or possibly Virginia. They had two sons born in Alabama. One was Ambrose Y. Stone who was born in 1815 and the other was Reuben Gilmore Stone born July 11, 1823. probably they had several other chilren including Sidney and William. They moved from Alabama to Osage County, Missouri in the late 1830's. In 1840 they moved to Pulaskie County and settled on Bag Maries in a log cabin with twenty foot square interiors, fifteen to eighteen inch faced hand hewn logs and dovetail corners. In 1844 a Primitive Baptist church was organized in their home. The log cabin then became both home and church. On October 11, 1845 a constitution for their church as drawn up and it was named the Friendship Baptist Church. Both of their sons, Reuben and Ambrose became Missouri Baptist Association delegates and were very active in the church. Reuben preached regularly in his father’s church while in his teens and was married there to Cecilia Lavinia Scott around the year 1845. The Stones migrated with their Friendship Baptist Church in a wagon train to eastern Llano County on West Walnut Creek sometime in 1853 where their son the Rev. Reuben Gilmore Stone reestablished the Friendship Church. [S3911] Meemawof10, family tree titled "King/Fisher Family Tree", published by Ancestry.com, www.ancestry.com, viewed Apr 2015 , date=29 Dec 1807 - don't know where this was from - the paper says 1790 (both dates on the same web site). [S841] S Anderson, family tree titled "USAncestors(ongoing-unedited-unfinished", published by Ancestry.com, wc.rootsweb.ancestry.com, from database named :1037677, updated Aug 2001, viewed Apr 2015. [S3913] 1940 US Federal Census, Pasadena, Los Angeles County, California, digital image ; National Archives micropublication, Ray J Ives head of household, roll T627_240, enumeration district 19-435, page 15A.